So cute. 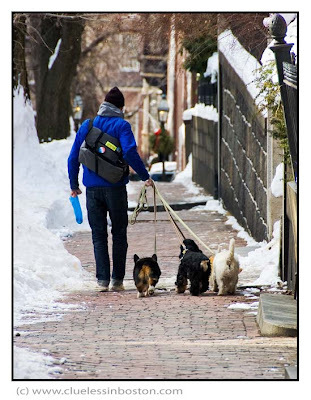 I used to walk my two dogs like this, but now have only one. There's a lady in our neighborhood with three little dogs that all regularly jog with her. Just perfect. Adore the shot. That little blue bag seems a "Bit"small for THree dogs!!!!! I read Kerouac already,but did not know W.Least Heat-Moon. I ordered it on Amazon Thanks. I'm happily ditch my job as a photographer to do this if it paid enough. Adorable image for me. This photo is so cute!!! This pic is funny,one man four dogs.